The last time my cousins were in town, Mike and I got a new kitchen. It’s been about a year and a half since we made any major changes to our humble abode, but for the last 5 days my cousins Tommy and Kam have been hard at work helping us transform the house again. This time, we’re finally finishing our master bath which has been an empty room since August 2011 when we renovated the master bedroom. 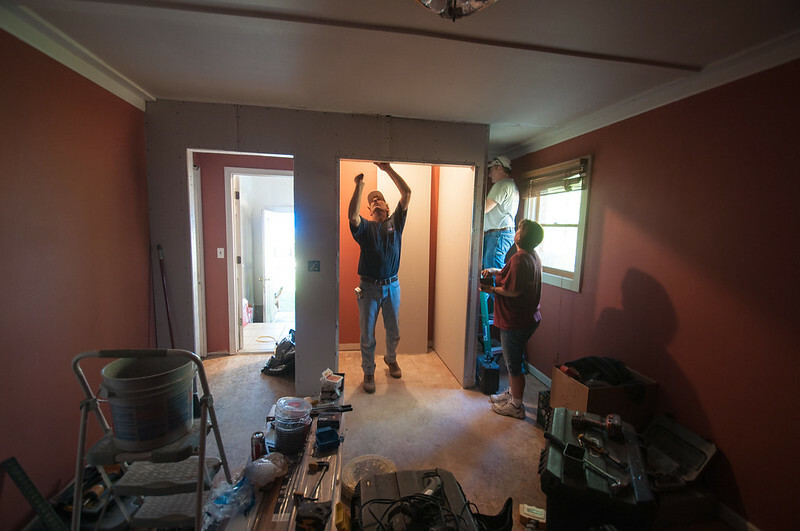 We’re also adding a closet to our guest room and creating a small entry hall to separate the guest room and the laundry room. 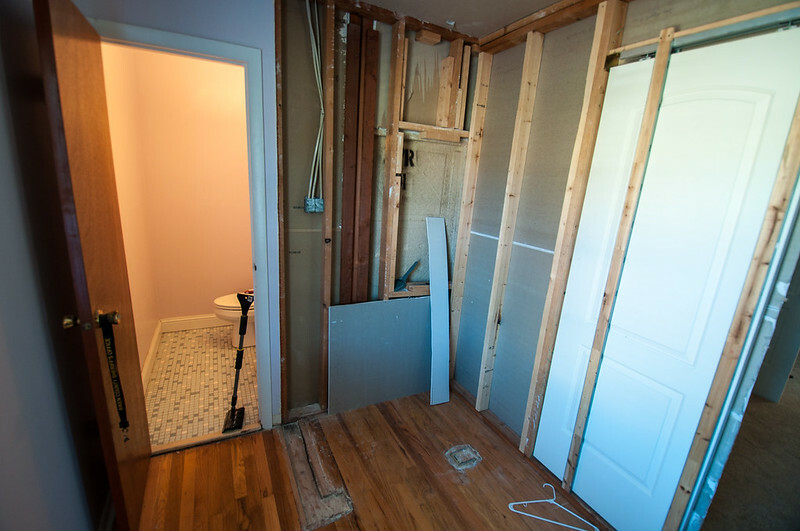 Mike and I got the project started by clearing out the bathroom and guest room, both of which had been used as temporary storage for the past 18 months. We also ripped up the old carpet in the guest room and got it ready for new flooring. My mom got into town last week and we immediately began shopping for bathroom tiles, laminate flooring, and other necessities. When my cousins arrived the next day, the work began. 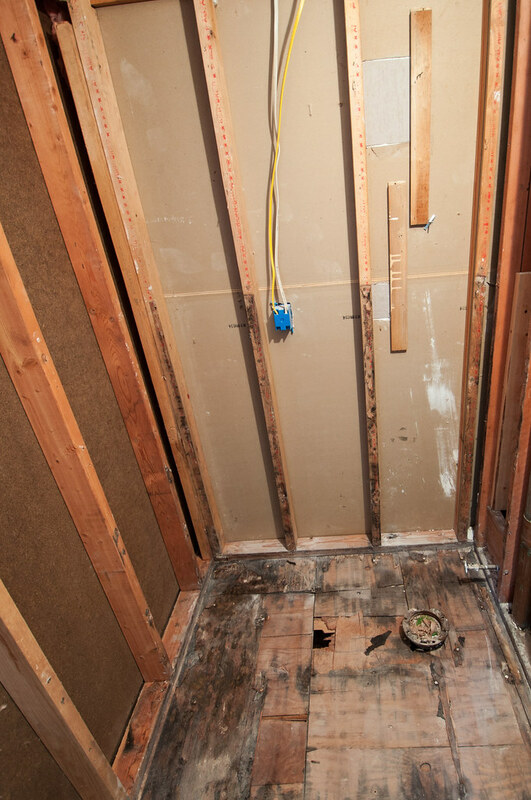 These are the “Before” photos of the guest room and bathroom. 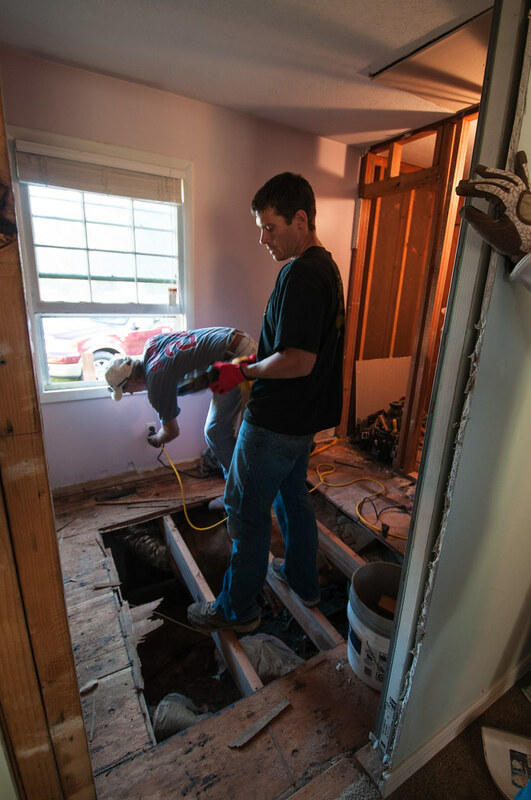 We are planning on turning the small water closet where the toilet is into a large tiled shower. The toilet and sinks will be in the larger area. 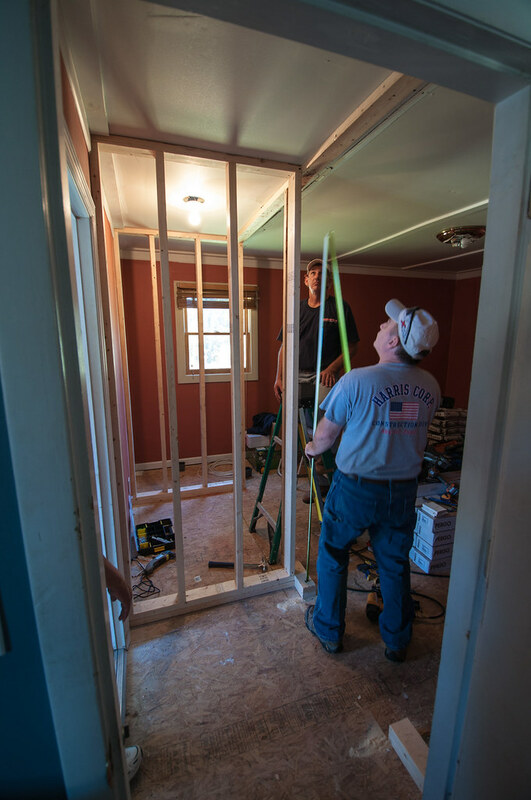 The first project we completed was getting the new entry way and closet framed. Before, the laundry room could only be accessed by going through the guest room, which is fine and dandy until you have guests over. Now we have a small entry way which allows for a little more privacy, and with a new closet, we have more storage! We are planning on creating a “Pet Station” in the space between the closet wall and the window, which will house the cats’ litter box, food, and other animal supplies. Next, Mike, Kam, and Tommy got to work ripping out the bathroom tiles and discovered some old water damage that had completely eaten through the floor. It’s a wonder nobody ever fell through – there was virtually nothing supporting it. 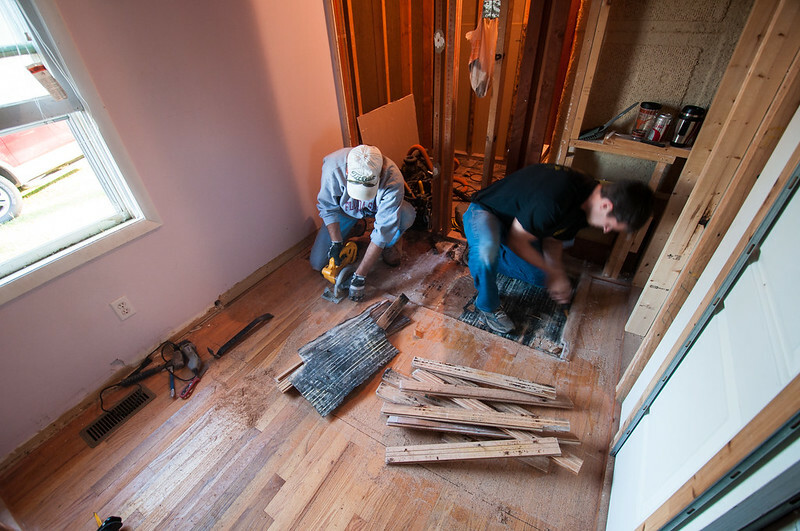 The mold and water damage extended out into the larger room, so all of the floor needed to be ripped up. This was a bit of a set back and a LOT of work. 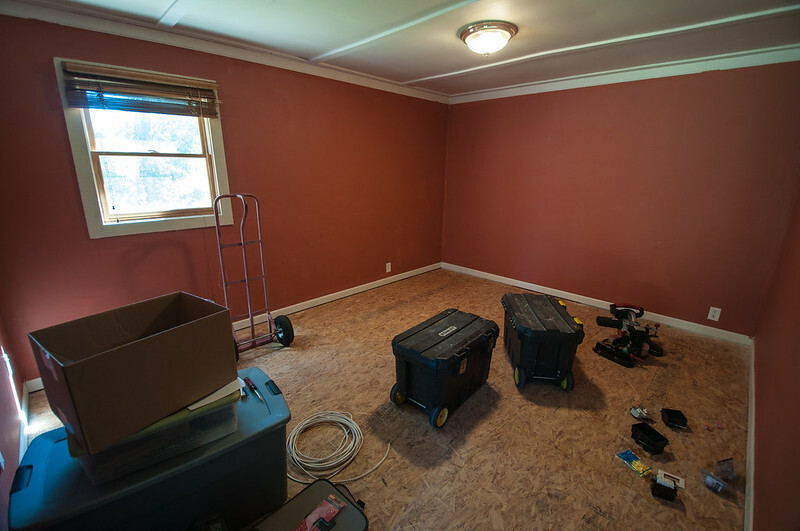 Stay tuned for more updates – yesterday and today was spent priming and painting the guest room, and soon they will begin installing the new laminate flooring.